Spring is here and we are finally beginning to see some sunshine peeking through the clouds. The beginning of the season is the perfect time to prepare for the warmer months ahead. Start planning your perfect patio now. We’ve put together this short checklist to help keep you on track. Begin with your list of wants and needs to assess your goals for this project. From there you can begin to research what you’ll need to accomplish them. If you have any questions, we are here to help! Just bring in a picture of what you want and we’ll handle the rest! Creating your perfect outdoor space begins with selecting the hardscaping material that fits your style and your budget. At Penn Stone, we feature Lancaster’s best selection of products for patios, landscape walls, and other hardscaping features. Landscape Stone: Stone delivers unmatched durability and nearly limitless color, shape and texture options to customize your new outdoor living space. 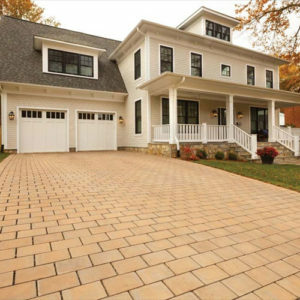 Brick Pavers: Genuine clay pavers are strong, durable, require minimal maintenance, and create pavements that age gracefully and look better with each passing year. 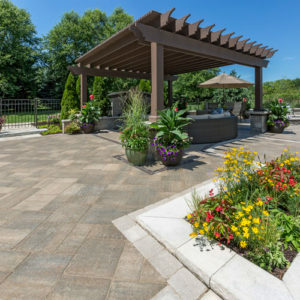 Concrete Hardscaping: Interlocking concrete pavers offer beautiful, affordable and functional solutions for creating patios, walkways, driveways, and walls. Porcelain Landscape Tiles: Porcelain tiles offer a beautiful range of new colors and provide a strong, durable and stain-resistant paving surface with a contemporary style. Permeable Pavers: Permeable pavers provide a functional solution for stormwater management and help protect our local and regional creeks, streams and rivers. After we help you choose the perfect product, we can connect you with one of our trusted contractors or offer DIY advice. We only recommend professionals who we know you can count on to do the job in a way that meets your goals and is straightforward, timely, and cost-effective, all while providing you with an overall good experience. Making a space part of your home is no easy task. It all starts with the right components. We are proud to offer everything you’ll need to bring the comforts of your home outside. 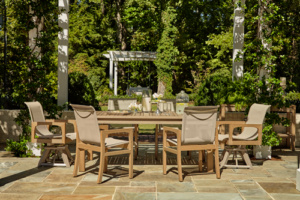 Personalize your outdoor space with stylish furniture, gorgeous planters, stunning fireplaces and more. Visit our showroom to design custom order furniture or pick up a few accent pieces to make the space yours!